The Pullman Paris La Defense is a five-star hotel located in the La Defense business district opposite the CNIT and just 10 minutes away from the center of Paris. Accommodations are equipped with air-conditioning, flat-screen HDTV with satellite channels, video on demand, Bose docking station, mini bar, tea and coffee making facilities, complimentary bottles of water, in-room safe, work desk, free WiFi internet access and en suite bathroom with tub, shower, hairdryer and signature toiletries. The in-house restaurant features an open kitchen and offers French specialties. In addition, a wide selection of international wines is available and guest can enjoy refreshments from the extensive variety of beverages at the bar. Other facilities and services include a well-equipped fitness centre, hammam, connectivity lounge and meeting and conference rooms. The Chateau Versailles, Arc De Triomphe, Louvre, Champs-Elysees and Eiffel Tower are some of the tourist destinations in the area. 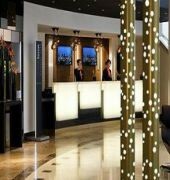 The PULLMAN PARIS LA DEFENSE is a Modern, Leisure, City hotel hotel. Located in City Centre - La Defense area. Shopping is right next door and the nightlife/restaurants are located in the hotel. Descriptionclass="small" style="text-align: justify; font-size:11px;">The Pullman Paris La Defense is a five-star hotel located in the La Defense business district opposite the CNIT and just 10 minutes away from the center of Paris. Accommodations are equipped with air-conditioning, flat-screen HDTV with satellite channels, video on demand, Bose docking station, mini bar, tea and coffee making facilities, complimentary bottles of water, in-room safe, work desk, free WiFi internet access and en suite bathroom with tub, shower, hairdryer and signature toiletries. The in-house restaurant features an open kitchen and offers French specialties. In addition, a wide selection of international wines is available and guest can enjoy refreshments from the extensive variety of beverages at the bar. Other facilities and services include a well-equipped fitness centre, hammam, connectivity lounge and meeting and conference rooms. The Chateau Versailles, Arc De Triomphe, Louvre, Champs-Elysees and Eiffel Tower are some of the tourist destinations in the area. I've been visiting the hotel frequently for the last year or less, and it's been amazing every time I visit. All of Pullman Hotel employees are super friendly and very helpful. I met Mrs. Marine three months ago, she's just wonderful, very friendly, so humble, and always ready to help! Today there was a small problem with the lighting at their library. After informing her, Mrs. Marine directly took action and called Mr. Raphael who immediately fixed the problem and made my stay much more comforting! Everyone here is always ready to help, even with small problems! They take care of every single thing at the hotel. I'm always happy to stay here! Stayed here for 4 nights, 2 adults and 2 teenagers in interconnecting rooms. I emailed the hotel prior to our visit with a minor query and received a prompt, cheery and helpful response for Margaux. This set the tone for our visit. We decided to take a taxi from CDG at a cost of 60â‚¬. We checked in with Gregory, he greeted us warmly and was informative. The rooms were spacious with all the facilities you would expect and the bathrooms were very clean with a shower and bath. A special mention for the beds, most comfy I've slept on! As usual the kids looked forward to breakfast the most! And they weren't disappointed. A vast choice of hot and cold breakfast items and eggs cooked to order by David and J.Sebastien, who were also friendly and nothing was too much trouble for them. Every single person we encountered at the hotel was warm and friendly. I didn't catch the hostess' name at breakfast, she was pleasant and greeted us with a smile every morning. We also had the excellent Louise help us with any queries we had. Whilst in Paris we visited the arc de triomphe, Eiffel tower, Versailles Palace and The Louvre, all were easy to get to to using the Metro, the walk from the hotel to the station was less than a 5 minute walk. Great room in the heart of the Paris business area. Great service with a staff always ready to look after you. I came 2 months ago and forgot my iphone charger there. They gave it to me back straight to my room. Love it. Thanks Bathilde, Yoann and Louise. - the overall hotel and location. Special thanks to Louise and Pauline for their great support and attentiveness.